Red cards are a familiar site in football today with many games left with less than 22 players on the pitch at the end. We even have clubs such as Sheffield United doing their level best to get as many players off as possible. That was not always the case and after football resumed after World War II Burnley had just one player sent off in the first nineteen years. For the younger supporters this might seem incredible but then a player would have to commit a very serious offence to be sent off. So what did the one Burnley player to be sent off in that period actually do? The answer is he reacted to being fouled but not by kicking lumps out of his opponent, nor spitting at him, in fact what Elliott did was to give him a dirty look. Despite the fact that it was a bad foul the referee took no action but on seeing the look from Elliott ordered him to the dressing room for a look of intent. 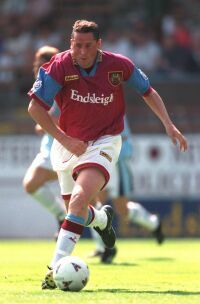 Billy Elliott’s stay at Burnley was not long, he moved to Sunderland after a hugely successful stay at Turf Moor, but his name will perhaps be always best remembered as the player who was sent off for a look of intent. When you make your first team debut as a young player you probably dream of being a hero, maybe scoring the winning goal or something like that. If you are a goalkeeper then maybe you hope to make a brilliant save that wins the game for you. Harry Thomson did just that when he gave away and saved a penalty on his debut at Leicester but in 1979 a young Burnley keeper had a debut that he must have wanted to forget. Brian Miller had just taken over as manager after a dreadful start to the season and after a defeat in his first game in charge he took us to league leaders QPR with goalkeeper Alan Stevenson out injured. In stepped youngster Billy O’Rourke for his first game and in front of the Match of the Day cameras. What happened next you would not wish on an enemy. QPR simply tore us apart and Billy seemed to spend the entire match picking the ball out of the net and the Clarets were beaten 7-0. As the final whistle blew the television cameras zoomed in on him as he left the field in tears. 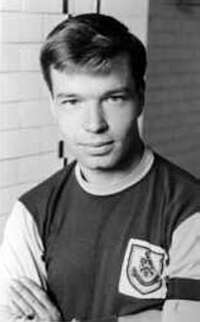 He was never a regular in the first team at Burnley and he was always remembered for his high profile debut. He left the club in 1984 and went on to play for Tranmere Rovers and Blackpool with some success. Sadly, and at the age of 41, Billy passed away in January of this year. When my dad took me to the 1962 FA Cup Final I was a distraught youngster at the end as the Clarets slipped to defeat. Somehow I had just expected us to go there and pick up the trophy. I left the stadium in almost silence, hurried out before the cup was lifted, with my cheeks dampened with the tears. My dad promised me that we would return and win and of course I believed him. The chances of even returning looked slim as we dropped down the divisions and when we lost the Sherpa Van final in 1988 I just about gave up hope. The play offs had been introduced by then but at this time the finals were two legs and so maybe the last chance had gone. Six years to the day after that Sherpa Van Final I was to find out just what it is like to win at Wembley and it is as good as I always thought it would be. 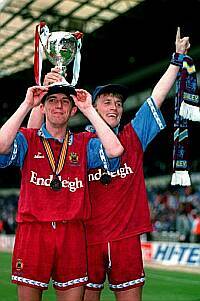 It might not have been an FA Cup Final, the stadium might not have been full (courtesy of badly supported opponents) but when referee David Elleray blew the final whistle it was one of the most memorable moments I can remember as a Claret. A little older by now but it didn’t stop the tears, they simply flowed. This time though they were tears of joy, albeit mixed with just a little sadness because my dad could no longer be there with me to celebrate our Wembley win. Not many players score 100 league goals, it is a remarkable achievement. 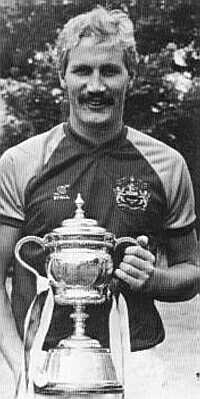 One Burnley player, Frank Casper, finally hit the magic total in 1975. 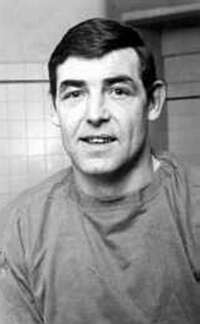 The 99th goal had come over 18 months earlier when Leeds defender Norman Hunter tried to end his career. 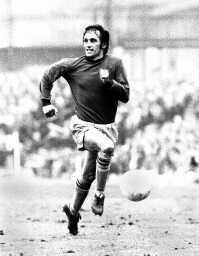 In fact Hunter was successful with his disgraceful running track challenge on Frank but the Burnley striker refused to give up and after missing virtually a season and a half and after a number of operations he finally returned to first team action in a home game against QPR. With time running out and the score 0-0 the Clarets won a free-kick outside the box at the Bee Hole End. QPR lined up their wall but Frank curled it round and gave the goalkeeper no chance as he scored the only goal of the game. It was his 100th league goal and how he celebrated reaching a milestone that for months and months had looked an impossible dream. Unfortunately Frank’s return was to be short lived and after an away defeat at Norwich in January he hung up his boots and took over a youth team coach. After two spells as manager he is now involved with the club’s kit suppliers TFG and I can reassure you that he still feels bitter towards Norman Hunter. Earlier in this series (number 83) we recalled an incident from the 2001/02 season when Nik Michopoulos saved from Mark Robins. Over forty years earlier there had been a similar incident at Turf Moor in a European Cup tie against SV Hamburg. With the Clarets in front the Germans had been putting some pressure on and we were having to defend resolutely. With internationals galore in our defence who were on top of their game we were able to handle just about everything Hamburg threw at us. That was until one fateful moment when one of the world’s greatest strikers at the time Uwe Seeler found space to get on the end of a cross. Seeler’s header was perfect but he looked on in sheer amazement as Burnley goalkeeper Adam Blacklaw made the most incredible of saves. Seeler just stood and applauded Adam still unable to believe that he had not pulled a goal back for his side. The Burnley fans cheered the big Scot but not out of surprise, they had seen him make many wonderful saves in the green jersey for the Clarets. 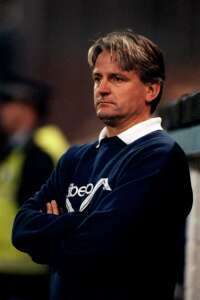 Shortly afterwards, in an FA Cup tie at Hillsborough, he was to be applauded again by an opposition player. This time it was Tommy McAnearney who thought he had given the Yorkshire club the lead. That game could have been Adam’s finest hour as he kept Wednesday at bay for almost 90 minutes winning us a replay that we went on to win. But the memory of the great Seeler stood applauding him will live in the memory. The 1965/66 season was coming to an exciting climax and three sides were in with a chance of winning the league title. There were Leeds United and Liverpool and there was Burnley. Despite a 2-0 win against Liverpool neither us nor Leeds could stop Shankly’s Liverpool clinching the title and so we were left chasing second place. With just two games left we met in a game that was to be called "The battle of Turf Moor". The game was preceded with a visit from Field Marshall Montgomery and he really was to witness a battle of all battles. Things got so bad that at one stage the referee had to call all the players together to try and calm them down. This of course was the sort of thing you expected when you played Leeds. We really needed to win but the longer the game went at 0-0 the less likely we looked to score. Then the game was decided on one of the most bizarre of own goals ever seen on the Turf. Burnley had successfully defended a Leeds attack and left-back Alex Elder had possession of the ball. He had a number of options and elected to knock the ball back to goalkeeper Adam Blacklaw unaware that Adam had come to the edge of his box on the left hand side to help him. Alex curled the ball straight over him and from the tightest of angles curled the ball into the corner of the net to give Leeds a 1-0 win. Two days later we won at Sheffield Wednesday, our last game of the season, to go back into second place but Leeds eventually got a 1-1 draw in their last game of the season at Old Trafford to go back above us. Our third place finish has not been repeated since. As for Alex, in a conversation with him last year he said that people always seem to recall that goal. For a player who was without doubt world class it seems wrong that a mistake should always be singled out but it really was unforgettable. When you start a season with six defeats in the first eight games you know you are going to be in for a long hard season. This is the sort of start that guarantees you will hear the phrase "It’s going to be a long hard winter" on many occasions. But that’s what happened in 1981/82. The ninth game was a 2-1 win at Portsmouth that at least lifted us off the bottom but none of us could have ever imagined how long it would be before we were to lose again. After that Portsmouth game John Jackson replaced Bob Lord as chairman and he could boast the longest unbeaten start of any chairman in the league. There were a lot of draws at first but in early 1982 we actually won six game on the run and suddenly from relegation certainties people were even considering us for promotion. Eventually after 20 games we finally lost and only then because of a dreadful offside decision by a linesman. It was Exeter who beat us 2-1 and a surprise 5-3 defeat at home to Southend was to be the only other defeat. After another great run we went to Southend on a Friday night with two games left knowing that a win would secure promotion. We didn’t just win, we murdered them. Striker Paul McGee scored twice and both full backs, Brian Laws and Andy Wharton, scored in a 4-1 in. It was a fantastic journey home with the Championship still a possibility, after the Saturday results we only really needed to avoid defeat against Chesterfield to clinch it. So to the Tuesday and early evening Burnley was hit by a deluge, it was hard to believe just where the rain was coming from. In 1982 we had no ‘Clive Holt covers’ and the pitch was soon flooded. A decision was made to delay kick off but with almost 19,000 in the ground the game eventually went ahead. It shouldn’t have, and wouldn’t have earlier in the season, and soon we were to wish that it hadn’t been as Chesterfield took the lead. There was talk on the terracing at half time about an abandonment but by now the rain had stopped. In the end it mattered not as Kevin Young broke through at the Bee Hole End to score an equaliser early in the second half. Turf Moor went wild and with no further goals we had just about done it. We had to wait 24 hours, had Carlisle won by seven the night after at Chester we would have been pushed into second place but they won 1-0. After a dreadful start to the season we won the league with just 2 defeats in the last 38 game and were Third Division Champions. Twice in recent times the Burnley fans have held organised demonstrations and twice they have had results. Both were aimed at the Teasdale administration. The first in January 1996 was called the 3:33 protest and at precisely 3:33 p.m. in the home game against Crewe the Turf Moor crowd were encouraged to stand and turn their backs on play for a minute. The response visibly shook the board as a massive majority showed their displeasure. Although the protest was aimed at the board they deflected the entire issue and within hours Jimmy Mullen was sacked as manager. Things didn’t improve and in late 1998 CISA organised a petition against the board alongside a sit in after the home game against Notts County. As it gained momentum and thousands were adding their names to the petition the board finally acted and in the week leading up to the sit in local businessman Barry Kilby bought out two of the existing directors. The sit in, on a cold and wet day, went ahead and again the response from the fans was magnificent. Things are not brilliant at the moment but certainly I don’t advocate any protests, however we do always know that we have had the power to force changes at Turf Moor. 22. How many yellows make a red? I think we all know that two yellow cards in a game for the same player means that he automatically receives a red card. Or do we? That theory was twice thrown out of the window early in the 1994/95 season as confusion reigned. We made the trip to Bootham Crescent for a League Cup tie against York City where new Burnley full-back Chris Vinnicombe received a yellow card from referee Uriah Rennie. Later in the game after another infringement Vinnicombe saw yellow again but astonishingly Rennie did not show the red card. Once he became aware of his error after the game he hastily decided to rescind the first yellow card to cover up for his error. Shortly afterwards we played at Millwall and on this occasion after a fairly innocuous challenge referee Mike Bailey waved a yellow card at Ted McMinn and with this being his second yellow he followed it up with a red card. But hang on this wasn’t Tin Man’s second yellow card at all, there had been no yellow card for him at any time earlier in the game. The game was held up for some time before it was eventually sorted out. This time the referee called Ted over and waved the yellow card at him again and allowed him to continue. Of course referees never get anything wrong. After a 3-1 defeat at Scarborough at the end of September 1991 manager Frank Casper left Turf Moor. Officially he resigned but it is thought that someone was pushing. His assistant Jimmy Mullen took temporary charge and got off to a winning start with a 2-0 win against Carlisle with goals from captain John Pender and youngster Graham Lancashire. It was Lancashire’s second goal in two games but more was to come. 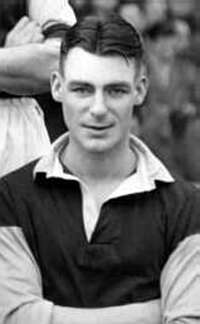 The week after at Wrexham he scored three as the Clarets recorded a 6-2 win. That was good enough for the board and Mullen was given the job on a permanent basis. But the winning didn’t stop and after another 2-0 home win, this time against Walsall, we went on our travels again and won at Lincoln and Halifax. Back home and York were beaten and then top of the table Mansfield. Suddenly we were moving up the table and there were more away wins at Maidstone and Northampton. All good things have to come to and end and Scunthorpe came to the Turf and picked up a point in a 1-1 draw to end the run. For Mullen though it was a dream start of played nine, won nine with five of them away from home. It couldn’t continue like that but no Burnley manager has ever made that sort of start.